Kinsa Sushi HillV2 is the second venture of Kinsa Sushi. This home grown Japanese restaurant was founded by 3 young men to share the passion of Japanese food dining. The concept of Kinsa Sushi is to provide a more family friendly environment with a lower price tag but not compromising the quality of food as they used the premium ingredients. From 10 May to 30 June 2015, Kinsa Sushi Hill V2 will be having an Oyster and Salmon promotions. (Check out the picture below for the menu). Each item will be presented in the form of sashimi, sushi, hot pot, grilled and deep fried. We started the tasting with Salmon and Roe with Japanese Yam - $6.90 (1 glass) and Oyster with Ponzu Sauce - $7.90 (1 pc). The salmon has a beautiful presentation, where the grated Japanese yam was set between the salmon and roe. It is also use to balance the saltiness from the salmon roe while combining the texture of the roe and the meat. The oyster tasted fresh and creamy, while the ponzu sauce offset any fishy flavour from the oyster. 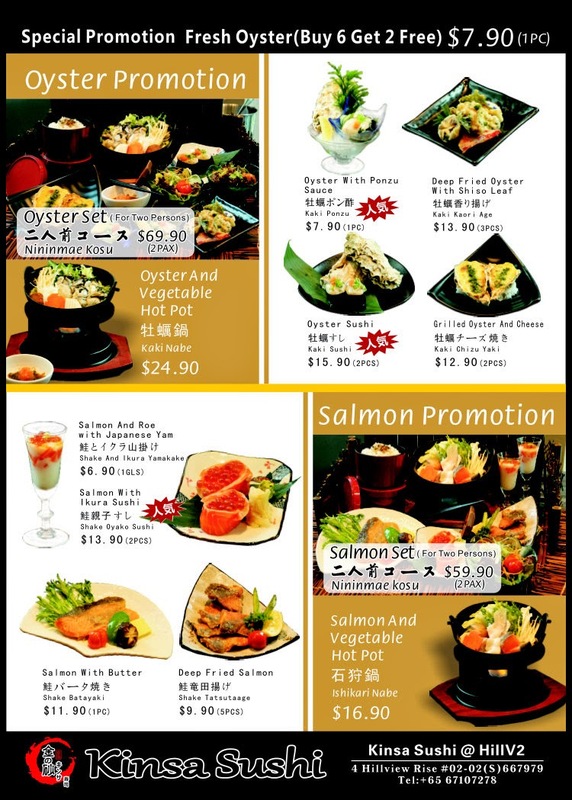 Salmon with Salmon Roe Sushi - $13.90 (2 pcs) and Oyster Sushi - $15.90 (2 pcs). The sushi rice has a nice texture. We can actually taste the freshness of the ingredients, with oyster sushi giving you a creamy texture and the silkiness texture of the salmon just give you the 'Wow' feel. The salmon roe in the sushi is flavourful enough that there is no need to dip the sushi in a soy sauce. From the Hot Pot we tried Oyster and Vegetable Hot Pot - $24.90 and Salmon and Vegetable Hot Pot - $16.90. The oyster hot pot come in clear broth and subtle in flavour. The oyster was plum and delicious. Meanwhile the salmon broth is more robust with milky colour. It uses the part of salmon near the fins, it was fresh, smooth and melts in your mouth. Grilled Salmon with Butter - $11.90 (1 pc) and Grilled Oyster and Cheese - $12.90 (2 pcs) followed next. The portion for the grilled salmon is quite huge, sliced from the area closer to the stomach of the fish and grilled with teriyaki sauce. It was sweet and the flesh is simply so filled with omega. The grilled oyster with cheese was presented in a aluminium foil made bowl. The cheese stuck to the foil made it difficult scoop the oyster. The chilli string on top gave the flavours a bit of twang. The presentation of the grilled oyster can be improved, so that it can gives us a more convenient way to savour this dish. From the fryer, we had Deep Fried Oyster with Shiso Leaf - $13.90 (3 pcs) and Deep Fried Salmon - $9.90 (5pcs). The oyster was lightly coated with shiso leaf and tempura batter. Shiso leaf has a slight minty and bitter taste, good balance for the creamy plum oyster. The salmon slices serve with shishito peppers are smaller compare to the grill salmon. More like the cuts closer to the tail of the salmon. Although I am a fan of fried salmon skin, I find the frying of salmon meat is a bit of waste. The texture become harder and missing the oily texture in the meat. Of course, this tasting will not be complete without the Kinsa Sushi signature Wagyudon - $24.80. Using A4 Kagoshima Wagyu, it was grilled to perfection. Served with their signature sauce and perfectly soft poached egg with runny yolk. Before digging in, you need to mix all of it together. You can add a touch of Japanese chilli powder if you like some kick in the don. The wagyu has a nice marbling and it just melts in your mouth. The sauce has a nice sweetness to it and the yolk just bind the whole dish together. Totally deserving to be a signature dish of Kinsa Sushi. Dessert was Black Sesame Mochi - $4. This golf ball size dessert normally has white smooth skin. The version here was covered with black sesame powder. It is slightly chewy, with the black sesame paste fillings. The taste is just nice and not overly sweet. Kinsa Sushi 'no track' conveyor belt will catch your eyes when you enter the restaurant. Using the magnetic technology and different colour of lights it sure is an attraction by itself. Also keep your eyes on the Exotic Seafood Tank. This tank will offer the fresh aquatic selections, where the ingredients come in twice to three times a week from Japan. Kinsa Sushi also applied '3 day rule', meaning the fish here will only be use for sashimi not more than 3 days after they have been caught. Kinsa provided two types of seating area, bench (Chef's Table) and regular table seating. It is interesting to sit at the bench area where you can watch the chef at work and receive your sushi order from the 'no track' conveyor belt. Overall, I find the Salmon Set Menu is more tastier and value for money. However, it is not everyday you have Japanese restaurant serving Oyster Set menu. So it is definitely an opportunity not to miss. As this promotion runs for more that 1.5 months, it will give plenty of opportunities to give each of promotional menu a try. Kanpai!! Cheers!! Thank you very much to Kinsa Sushi team for the food tasting invitation.